Set on 19 acres of lush palm filled gardens with almost a mile of beach frontage, Pacific Resort Aitutaki is a private, intimate, romantic hideaway for the most discerning traveller. As a member of the Small Luxury Hotels of the World we delight our guests with indulgent touches such as Bulgari bath products in all rooms which are Polynesian-inspired in architecture and design. And even when this idyllic island experience comes to an end, the magic of Aitutaki and Pacific Resort Aitutaki will remain in your hearts forever! The stunning beauty of Pacific Resort Aitutaki’s surrounds makes it a natural choice for those in search of romance in South Seas Polynesia. Enjoy dinner at sunset in a private Bedouin style tent on the beach surrounded by flaming torches or a luxurious and intimate dinner held beachside or on your private deck – popular with honeymooners who are also welcomed with a complimentary bottle of wine, flowers and small gift on arrival. Take in the mesmerising panoramic views over Aitutaki Lagoon dining on international cuisine and enjoying world class wines at Rapae Bay Restaurant. Offering the finest food and beverage, including local fresh Aitutaki produce and a sumptuous seafood, Rapae Bay will astound you with an elegant menu and service matched by no other. Sip on a refreshing cocktail or enjoy a casual meal poolside at the popular Black Rock Bar. Named after the striking volcanic rocks that frame Amuri Beach, Black Rock Bar allows guests to relax and socialise whilst taking advantage of the food and beverage service available on the beach. Room service is available if you prefer to dine from the comfort of your own room. Venture out onto the manicured resort grounds and discover the picturesque infinity pool that appears to extend endlessly into the distance. Take time at Pacific Resort Aitutaki and spend your days in a way that suits you. Spend lazy days at the resort lounging by the pool or on the beach or in a hammock stretched between two palm trees. Visit our on-site Tiare Spa to pamper yourself with massage or beauty treatments, or make use of the complimentary snorkelling gear to have a marine adventure exploring our unique self guided Aquatic Eco trail and discover an underwater world filled with exotic and beautiful sea life. Join in our daily activities such as a Conversation with a Cook Islander, or ei making. Enjoy a kayak or Stand Up Paddleboarding along the resort coastline, or a private session in our gym which boasts one of the best views in the world! For a marine adventure jump aboard one of the many lagoon cruises offered by friendly locals, or stay on dry land and explore local villages by scooter or complimentary bicycle. A trek to Aitutaki’s highest point will reward you with a stunning 360 degree view of the island and lagoon that has to be seen to be believed. Try your hand at flyfishing, the lagoon is renown for bonefishing. With the drop off from the reef being sudden, it allows one to be deep water fishing within minutes from the resort. Visit our on-site Tiare Spa to pamper yourself with a massage or one of our beauty treatments. 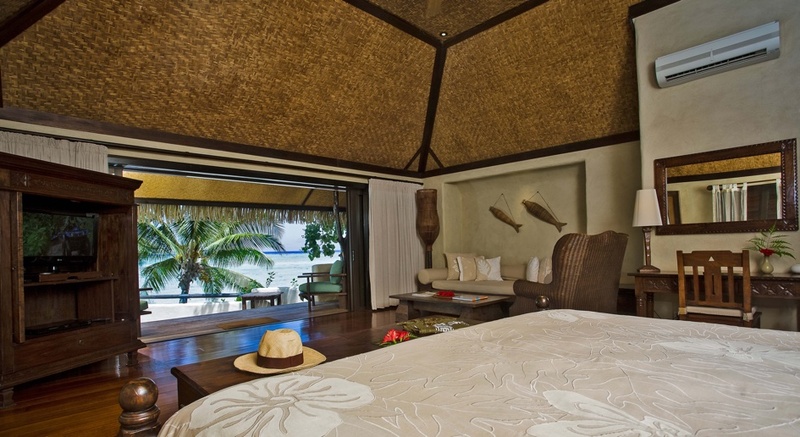 Experience ultimate relaxation in a peaceful Polynesian setting while listening to the sound of the waves. Our facials feature Te Tika products, an all time favourite. Te Tika is a line of organic products made from ingredients exclusively from the Cook Islands and manufactured in Australia. The Te Tika range is also available for purchase at the Tiare Spa. Children of all ages are permitted at the resort year round. Daily fully cooked a-la-carte breakfasts are included in the nightly rate as well as return airport & resort transfers on Aitutaki. Guests will enjoy fresh coconut nu drink on arrival at the resort, and have access to complimentary use of snorkelling gear, kayaks, stand up paddleboards and bicycles throughout their stay.